A guitar owned by legendary British musician Eric Clapton was sold at a Christie's auction for $959,500 (approximately Rs 4.41 crore) in New York on Thursday night (June 24) making it the most expensive guitar in the world. A Fender Stratocaster, which Clapton nicknamed 'Blackie,' was sold for six times the price it was expected to garner. The guitar was bought by an American chain of shops called 'The Guitar Center.' Clapton used the guitar from 1973 to 1985 on stage, but 'retired' it in 1991. The Christie's auction also saw a whole lot of other Clapton items being sold. One of Clapton's guitars  the 1964 Gibson ES-335  too was sold for $847,500 (Rs 3.89 crore) to The Guitar Center. 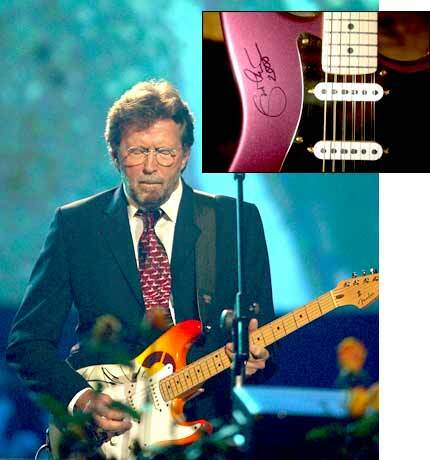 Another Clapton guitar was purchased for $791,500 (Rs 3.64 crore). The auction raised $7.43 million (Rs 34.178 crore) selling items donated by famous musicians. The proceeds of the sale of the guitars will go towards Clapton's Crossroads addiction clinic, which he founded in 1998 and is its chairman of the board.